During the humid Midwestern summer of 2013, I turned to this question posed by Louis Lozowick in the 1930 edition of New Masses. I had just moved to Chicago to curate public practice and direct engagement at the Block Museum at Northwestern University. The first exhibition I sunk my teeth into as a programmer was The Left Front: Radical Art in the “Red Decade,” 1929–1940—a historic show focused on artists and writers from the 1930s invested in social change and involved in the activities of the John Reed Clubs and ensuing American Artists’ Congress. The exhibition had clear resonance with Chicago’s legacy of social and civic activism and the rich community of socially-engaged artists currently doing work ranging from social practice to photo journalism, to urban planning and legislative transformation. What are the issues around which artists might band together here and now in Chicago? What are the possibilities and impediments to producing revolutionary art today? Does it exist, and if so, in what forms? Where? As cultural producers, how do we look to history, beyond nostalgia? 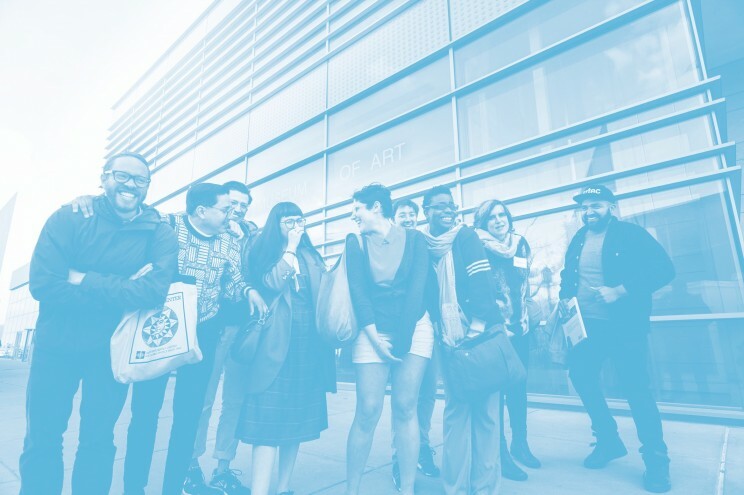 We began a line of inquiry in the summer, asking Chicagoans “What is revolutionary art today?” We published their responses as part of the exhibition’s newspaper catalog and produced a parallel online platform. The gravity of the question and the energy of many of the local responses helped me realize that there was an opportunity for real conversation. Inspired by the platform of the 1936 American Artists’ Congress, I decided to host an artists congress. In order to do it right, I knew I needed partners. In the spirit of collectivity, I invited Daniel Tucker and Michael Rakowitz, two colleagues I deeply respect for their work and ethics, to help imagine a contemporary Artists Congress. We began planning meetings at Northwestern with faculty members coming from the fields of American Studies, Anthropology, Art History, Art Theory & Practice, Comparative Literature, History, and Journalism. We next reached out to a broad net of contacts across the Chicago area, from frontline activists, to artists teaching at area schools. Over a series of conversations and debates, we discussed issues of social justice spanning global climate change, wealth inequity, the prison industrial complex, gun violence, and gender disparity. En lieu of picking a single issue around which to rally, we created platforms for stakeholders to continue to share their own perspectives and calls to action. 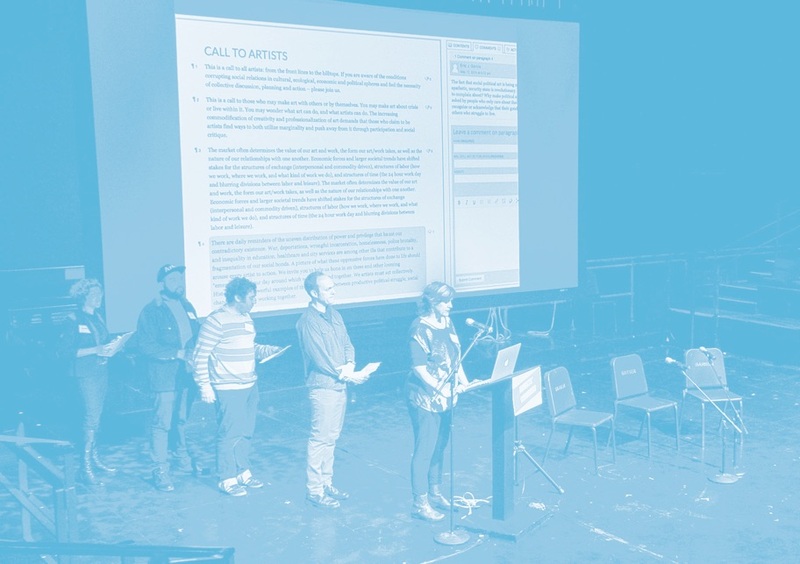 The process led to the collaborative writing of a malleable open Call to Artists, which we developed for the Congress held on May 17, 2014, and is included below. We intended this call act as part of an ongoing process, so I invite you to continue, edit, interrupt, and interpret the Call for Artists for the present, in Chicago and Dublin. This is a call to all artists: from the front lines to the hilltops. If you are aware of the conditions corrupting social relations in cultural, ecological, economic and political spheres and feel the necessity of collective discussion, planning and action – please join us. This is a call to those who may make art with others or by themselves. You may make art about crisis or live within it. You may wonder what art can do, and what artists can do. The increasing commodification of creativity and professionalization of art demands that those who claim to be artists find ways to both utilize marginality and push away from it through participation and social critique. The market often determines the value of our art and work, the form our art/work takes, as well as the nature of our relationships with one another. Economic forces and larger societal trends have shifted stakes for the structures of exchange (interpersonal and commodity driven), structures of labor (how we work, where we work, and what kind of work we do), and structures of time (the 24 hour work day and blurring divisions between labor and leisure). The market often determines the value of our art and work, the form our art/work takes, as well as the nature of our relationships with one another. Economic forces and larger societal trends have shifted stakes for the structures of exchange (interpersonal and commodity driven), structures of labor (how we work, where we work, and what kind of work we do), and structures of time (the 24 hour work day and blurring divisions between labor and leisure). There are daily reminders of the uneven distribution of power and privilege that haunt our contradictory existence. War, deportations, wrongful incarceration, homelessness, police brutality, and inequality in education, healthcare and city services are among other ills that contribute to a fragmentation of our social bonds. A picture of what these oppressive forces have done to life should arouse every artist to action. We invite you to help us hone in on these and other looming “emergencies” of our day around which we might band together. We artists must act collectively. History gives us powerful examples of the relationship between productive political struggle, social change, and artists working together. We must look for alliances where we have failed to look before. There is a need for organization on a larger scale, starting in Chicago. Building on the traditions of the American Artists’ Congress, the Association for the Advancement of Creative Musicians, the Black Artists Retreat, the Chicago John Reed Club, the Chicago Women’s Liberation Graphics Union, the Department of Space and Land Reclamation, the Interracial South Side Cultural Conference, Ladyfest Midwest, the Wall of Respect, Women’s Action Coalition, and We Want More– we come together again.